All my life has been lately is paint/grade, paint/grade, paint a LOT, and grade some MORE! This old house is an awful lot of work. It seems to have come at a bad time when I have endless stacks of multiples of 94 papers in the crush of work prior to Christmas vacation. It hasn't even felt like Christmas around here because Jeff and I have been working so hard. We have not dabbled in the traditional Elf viewing or seasonal shopping outings. We have been moonlighting as painters in the evenings and the weekends, often staying at the house until 2 A.M. on Friday and Saturday nights! Milt likes to lie on our drop clothes and chew what he can find. What's the rush? Our apartment lease is up January 7th, and we have very few weekends to accomplish everything especially with travels to both Louisiana (to drop the Milt with his grandparents and later pick up), as well as New York to visit my family. We feel the pressure. For our color scheme, (as I like to explain it), we are going with sun (yellow) all throughout the house, sky (bright blue) in our bed and bath, and grass (mint green) in the guest bed and bath. Picking the exact shade of paint that I had envisioned was more difficult than I would have ever thought. The yellow is too pale and the blue is too bright, and hopefully when I pick the mint it will be just right. After a few weeks though, I am certain the walls will just fade into the background. 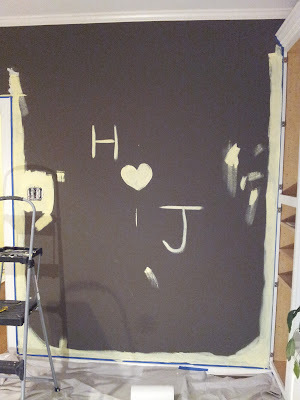 Painting is not cut and dry in our household. Jeff is absolutely fastidious with the details. Here are the steps of painting for us per room, and we are painting 10 rooms total! : spackle all the cracks, texturize the cracks, sand the cracks, tape the important parts, edge around the important parts, roller the walls, return for edge touch ups, return for roller touch ups, sweep, scour floor for drips and clean. When I think I'm almost done, I'm not because Jeff the Taskmaster creeps in and spots something that needs a little more work... Oh, joy. 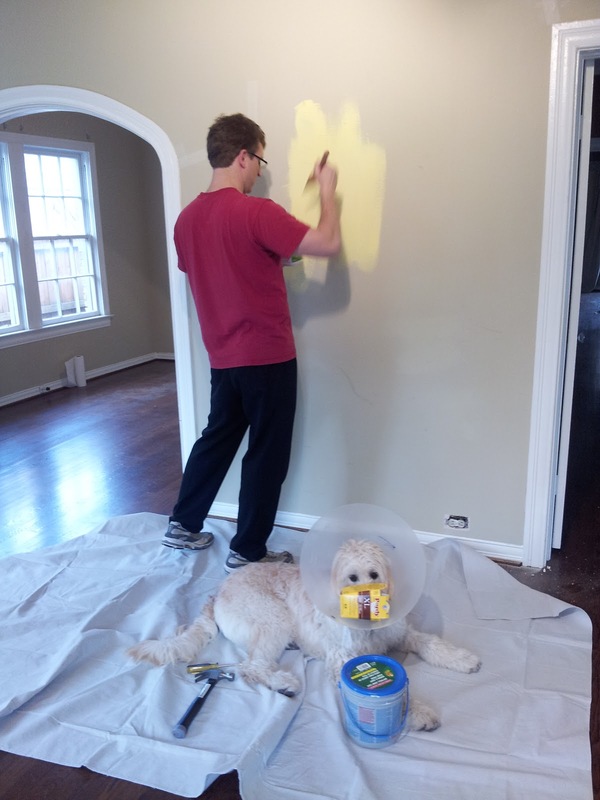 While we paint, the Milt can be in the room if we are prepping or working up high, but when the rollers come out, the Milt is banished to the outside which he is not too fond of. To think that this doodle now has his very own yard, and all he wants to do is scurry back inside with his Momma and Daddy. At least he gets to bark at the neighbors a bit while he's out there, so it could be worse...! great colors!! painting is fun and very gratifying when everything is complete. can't wait to see the place. Oh, My Gosh. I can already imagining the beautiful spaces inside by looking at the photo with Milton sitting in front of the fire place. Take care and don't work too hard!!!!! Before and after photos are the bomb, so glad to see some here. So excited for you all!